First up in our series of “Ten Best” columns is a look at ten Auburn football games that never actually took place. They could’ve been, and maybe should’ve been, but none of them ever actually were. We don’t make any attempt to rank these—they’re pretty much in random order—though the last one down below here may have been the most consequential, believe it or not. Commenters are encouraged to give us the order you see them in. Commenters are also welcome to add other games we may have missed. This is the ten we came up with when mulling the topic over this week, but we’re sure there are lots more—particularly back in the pre-Pat Dye days, into the depths of which our memories unfortunately do not extend. After two somewhat disappointing efforts in 1984 and 1985 (and nothing makes AU seasons more disappointing than losing Iron Bowls that should never have been lost), Auburn rebounded in 1986 by unveiling a high-flying (for its day) aerial attack in place of the old “Bo left/right/middle” approach. QB Jeff Burger aired it out to receivers like Trey Gainous and Lawyer Tillman while the ground game scarcely lost a step in the capable hands (and feet) of Bo’s so-called “nuclear sub,” Brent Fullwood. After the famous “Reverse to Victory” win over Alabama, the Tigers found themselves at 4-2 in the SEC and out of the running for the Sugar Bowl—but at 9-2 overall and in prime position for a New Year’s Day bowl. Pat Dye quickly accepted a bid to play Southern Cal in the Citrus Bowl—only to have the Orange Bowl come along afterward and ask Auburn to participate in their game instead. Dye stuck to his word and Auburn went on to defeat Southern Cal in Orlando, 16-7, while Arkansas accepted an at-large bid to play Big Eight champs Oklahoma in the Orange Bowl. Could the Tigers have fared better than the Razorbacks, who gave up 42 points to the Sooners and managed only a single TD as the clock expired? We will never know—but Auburn vs. Oklahoma in the 1986/87 Orange Bowl remains one of the greatest games Auburn never played. If only Auburn had kept LSU from scoring that last-minute touchdown and making an ugly, 6-0 win into a hideous, 7-6 “Earthquake,” the Tigers would have likely finished the 1988 season undefeated and would have been sitting there in New Orleans on January 2, awaiting a matchup with the top-ranked Notre Dame Fighting Irish—and with the national championship on the line. Instead, that Lou Holtz-coached and Tony Rice-led Notre Dame squad went on to play and defeat a sub-par West Virginia team for the title, while a disappointed Auburn fell to surging Florida State in the Sugar Bowl, 13-7. At least one Auburn player would later say that the LSU “Earthquake Game” was what galvanized the Tigers to play so well the rest of the way—so perhaps Auburn needed that loss in order to end up SEC Champions and get to New Orleans. Then again, maybe a win in Baton Rouge would have done the trick just as well—and led what was arguably one of the finest Tigers squads in history to the brink of a national championship. And the Tigers would have won that game. Their offense wasn’t bad, with Reggie Slack giving to James Joseph and Stacey Danley out of the backfield and throwing to a bevy of talented receivers such as Lawyer Tillman, Freddie Weygand, Duke Donaldson, and Alexander Wright, not to mention tight end Walter Reeves. * Meanwhile, Auburn’s 1988 defense was one of the greatest in school history, allowing just over seven points per game. They allowed a mere seventy-nine points over the entire regular season. Didn’t the 2010 National Champion Tigers’ defense allow that many points to Arkansas alone? Everyone knows the deal here, right? Auburn finished the 1993 season at 11-0 in Terry Bowden’s first campaign on the Plains, but had been ruled ineligible by the NCAA for any post-season play—including the conference championship game. Thus Auburn stayed home and watched the team they had just beaten, Western Division runners-up Alabama, play and lose to the Florida Gators—a team the Tigers had already beaten once (38-35, in Auburn), and would beat again when they played one another the following year (36-33, in Gainesville). Had the Tigers been allowed to play in the postseason and had they defeated the Gators again, Terry Bowden might well have faced his father, Bobby Bowden, for the first time —in the Sugar Bowl, with the National Championship on the line. Auburn played Florida State in Jordan-Hare in 1983, 1985, 1987, and 1990, and in Tallahassee in 1984 and 1989, along with a Sugar Bowl meeting after the 1988 season. Auburn won this epic mini-series with a record of four wins and three losses, and each of the games was memorable in one way or another. The 1984 game was a track meet–the two teams scored back and forth until time expired with Auburn up, 42-41, and FSU on the Tigers goal line. 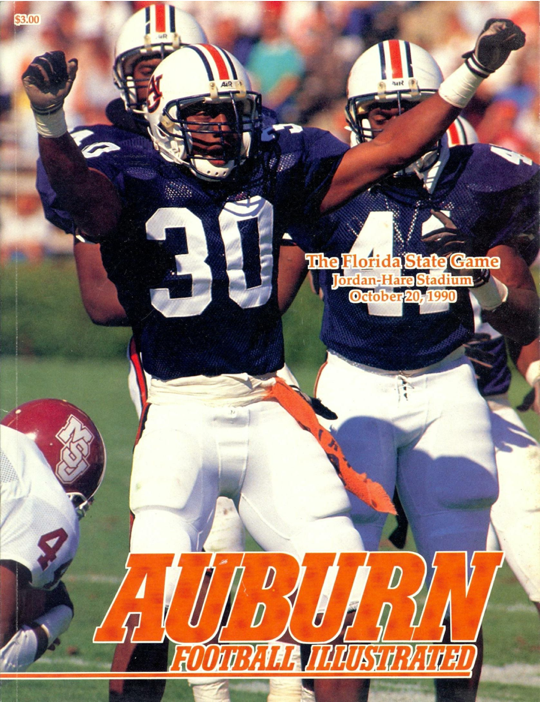 The 1985 edition looked to be a repeat until Auburn pulled away late, in a fashion very reminiscent of the 2010 Arkansas game, and won 59-27. FSU returned the favor with a blowout win of its own in 1987. Auburn’s wins in 1983 and 1990** were by very narrow margins, as were Florida State’s 1988 and 1989 wins. The only year between 1983 and 1990 in which the two didn’t meet was 1986. What might have happened in a hypothetical Tigers-Seminoles clash that season? That year was a rebound season for the Tigers, who had come off a thrashing at the hands of Texas A&M in the Cotton Bowl to finish the year (and Bo Jackson’s career) at 8-4. For 1986, Coach Pat Dye put Pat Sullivan in charge of quarterbacks, and the result was a very decent passing game led by junior QB Jeff Burger. As has been mentioned elsewhere in this column, the Tigers ended up at 10-2 and very narrowly missed out on a Sugar Bowl berth. With Mickey Andrews in charge of the defense, the Seminoles would at last have a unit on that side of the ball to rival or surpass their fantastic offensive prowess setting the stage for the epic run of success the program enjoyed between 1987 and 2000. But in 1986 things hadn’t quite jelled yet, and the Seminoles finished at 7-4-1. They lost on the road at Nebraska, Michigan, and Miami, and at home to Florida; their tie came against North Carolina at home in the third game. None of their wins, against the likes of Wichita State, Southern Miss,and Louisville, appears all that impressive. Given this evidence, one must assume the Tigers would have gotten the better of the ‘Noles that year–perhaps by a wide margin. One imagines Burger throwing for a lot of yards and Brent Fullwood and Tommie Agee running for even more. Of course, we can never know for certain, and the series did have the propensity for producing eye-popping outcomes in both directions. But it would have been nice to deliver one more solid beat-down to the up-and-coming ‘Noles, and to extend the Tigers’ winning margin in the modern series to more than one game. The thinking here is that this would have happened. With the dismissal/resignation of Terry Bowden partway through the 1998 season, Auburn lost all incentive to begin the following year’s campaign against Bowden’s dad’s pre-season #1-ranked Florida State team. New head coach Tommy Tuberville, seeing the rather shoddy state of the squad he was inheriting, either asked for or went along with the AU Athletic Department’s decision to buy Auburn’s way out of that opening game. The contract had stipulated that either team could pay a lump sum up front and cancel the game, and that’s what Auburn did. The elder Bowden at first publicly supported the decision, commenting at the time that it didn’t make sense to him to still play the game, since the only reason he had even considered putting Auburn back on the schedule again (after a run of six regular-season games and a bowl in the 1980s, with AU winning four of them) was the novelty of having father coach against son. But, predictably, as the jackals of the media descended to pick Auburn and Tuberville apart as “War Chickens,” Bobby B. began to change his tune and to decry the Tigers for opting out of the game. Florida State went on to win its second national championship that season, while Auburn barely survived its opening game with the team that replaced the Seminoles on the schedule: Appalachian State. One more win that season and Auburn would have made a bowl game; only extremely narrow last-second losses to Ole Miss and Miss State kept them out. Perhaps the powers-that-were in the AD’s office knew what they were doing, after all. Yes, Auburn did play LSU in 2001—on December 1, two weeks after the Iron Bowl! In fact, it amounted to a de facto SEC Western Division Championship Game, since the winner would advance to Atlanta to play Tennessee. But the game was not originally scheduled for that date, or even that month. It was originally to have happened in mid-September, and was derailed by the terrorist attacks on New York City and Washington, DC of September 11. Auburn lost a tough, 27-14 contest to the Bayou Bengals in December—but what would have happened if the two teams had met on the original date of September 15? Remember, the 2001 Iron Bowl was one of the worst ever for Auburn; the Tigers managed to give up thirty-one points and score only seven in their second consecutive loss to Alabama in Jordan-Hare Stadium. Even with a week off, the demoralizing effects of that game had to linger into the LSU contest. With a win over LSU in September, the Iron Bowl loss wouldn’t have affected the Tigers’ fate—and they’d have had their rematch in Atlanta with the Vols three years earlier than it ultimately came. Could they have beaten a UT team potentially headed for a national championship matchup that year? LSU did! The 1993/94 Sugar Bowl or Citrus Bowl? There’s no way of knowing to which bowl game the 1993 Auburn Tigers would have been invited, simply because they first would have had to face Florida in a rematch game in Atlanta in the SEC Championship Game. If they had won, they’d have been 12-0 and surely in the Sugar Bowl with perhaps Florida State opposite them, the title on the line. If they’d lost to the Gators, though, they’d have been 11-1 and not fallen too far—probably to the Citrus Bowl, in place of Tennessee, although they might have been chosen as an at-large team in place of Miami for the Fiesta Bowl against Arizona. That could have been interesting. For the 1994 season, however, the options a bowl-bound Auburn team would have faced at 9-1-1 were a bit more restricted. The likelihood, as we see it, is for the Tigers to have landed in the Peach Bowl (in place of 8-4 Mississippi State) against a 9-3 North Carolina State. You’d think they would have had a better option than that, but digging through the bowl matchups from that season doesn’t really produce a lot of better options. Maybe they could have replaced Tennessee in the Gator Bowl against Virginia Tech? Here’s the bowl list for that year—where do you think the Tigers would have landed? Auburn played Georgia Tech in 2003 for the first time since their ongoing series had ended with the 1987 matchup. The Yellowjackets defeated the Tigers, 17-3, in a season in which the Tigers mostly struggled on offense with a coordinator-by-committee approach that attempted unsuccessfully to replicate the success and the strategies of Bobby Petrino the previous season. The game was not originally to have been played at Grant Field, however. That stadium was under renovation at the time, and the plan was to have been for the Tigers and Yellowjackets to meet in the Georgia Dome that season, with a 50/50 ticket split, followed by a home-and-home arrangement for 2004 and 2005. Tech changed the deal so that they could open the season with Auburn in their expanded facility in 2003, and the 2004 game was dropped entirely. The 2005 game was a home matchup for the Tigers. Aside from the disappointment of fans who had hoped to watch the two teams face off before an evenly-divided Georgia Dome in 2003, one other thing perhaps merits a moment’s thought: The Yellowjackets defeated the Tigers in both actual contests—in 2003 and again in 2005. And 2004 was Auburn’s perfect season. What would have happened if the Tigers had faced Tech that year? Auburn fans doubtlessly scoff at this; the 2004 team was a juggernaut, well-coached and hungry. And yet, and yet, and yet… you never know. And, because of the change to the agreement, we never will. The fact that Auburn did not get to play Bowling Green—a team originally on their schedule but later swiped by another program—is far more significant to Tigers history than you may realize. And it gets even stranger than that. Everyone remembers 2004. Auburn went undefeated but finished third in the BCS rankings after the conference title games were played, and thus were left out of the national championship game in favor of Southern Cal and Oklahoma. One major reason often cited for Auburn being ranked below the Sooners was Auburn’s strength of out-of-conference schedule compared with OU’s. In particular, people point to the fact that Auburn played the “lowly” Citadel. But why was the Citadel on Auburn’s schedule? They were a last-minute replacement after one of Auburn’s original non-conference opponents, Bowling Green, was paid to drop Auburn and play them instead. This was a good and relatively highly-regarded Bowling Green team—and the head coach was none other than Urban Meyer! Thus the Falcons boosted their new opponent’s strength of schedule and hurt Auburn’s when they took the money and switched. What team paid Bowling Green to drop Auburn and play them instead? Why, Oklahoma, of course. * Here’s a little bonus trivia question: In what we consider the modern era (1981-present), Auburn has played in four Sugar Bowls: 1983, 1987, 1988, and 2004. In those games combined, how many touchdowns has Auburn scored, and who are the players who ran or caught those touchdowns? ** The 1990 win over FSU at Jordan-Hare was the scene of an infamous “giant group hug” immediately after the game, in which both of your intrepid Wishbone columnists were caught up in a massive and emotional melee in the stands and ended up actually falling two rows down before the scrum broke apart. This was followed by a lengthy rendition of the Seminole war chant by the Auburn student section, directed at the visiting fans as they filed out of the stadium. Van confesses that he was shamefully joining in the arm-chopping and chanting while John was telling everyone to cut out the foolishness. The 2001 LSU game was also the game in which Auburn was hit with a 15 yard penalty BEFORE THE GAME STARTED for jumping in the Tiger Eyes, wasn’t it? The officials threw the flag during pregame (didn’t know that was even allowable) and LSU led the game with an onside kick and score. I think. It may not have happened exactly like that, but that’s what I remember right off-hand. 1987 – 1 TD…Walter Reeves? Also, if the 01 LSU game had been played in Sept, as scheduled, Cadillac would have been healthy & would’ve played. -The 2010 Chick-Fil-A kickoff against UCLA. Does Cam have a coming-out party a few weeks earlier, or do we still have kinks to work out? -The 1991 Iron Bowl…in Auburn. Auburn was “forced” to play one last home game in Birmingham and lost to bama by 7. What if that game is in Auburn? -The 2002 SEC Championship game – If Michael Johnson doesn’t push Horace Willis on 4th and 15, it would have been a rematch of Auburn-Florida (instead of Arkansas-Georgia). Florida won the first game in OT, but that Auburn team gelled in the second half of that game (after Campbell replaced Cobb for good) and the only loss the rest of the way was that UGA game. -2004 SEC Championship game…against Georgia – Georgia was, I believe, the 3rd best team in the country in 2004 (behind Auburn and SC). Somehow, they lost to an average UT team and then lost the tiebreaker when both finished 6-2. What if Georgia wins that game, Auburn beats them again in Atlanta, and Auburn’s SOS gets a bump from playing a better team in the SECCG? Out of the originals, the changed GT series is the biggest one to me. That could have changed the entire 04 season as well. If I remember correctly, Urban Meyer had moved on from Bowling Green by 2004 and was the head coach at Utah. Gregg Brandon (Meyer’s offensive coordinator there 2000-02) was the head coach at Bowling Green in 2004. So that’s just three TDs in four games…good thing for Al Del Greco, Win Lyle, and John Vaughn! 19 showing that Oklahoma put up. I’m thinking that it was Lawyer Tillman catching the TD against Syracuse in the 87 Sugar and Walter Reeves catching the TD against FSU in the 88 Sugar. Good additions and corrections so far, guys. I agree–the 2004/05 Orange should have been included. Whoops. uh yeah urbz had definitely left bowling green by 2004. 04 was the year he coached Alex Smith and Utah to the Fiesta Bowl. That’s true about Caddy in ’01. I forgot he was just starting out that year. What stuck out for me about his first two seasons was that he only played one quarter against Alabama those first two years (hurt in the 1st in 2001, and already out for season after UF in 02) and did not play against LSU until his junior (!) season, because the 01 game was moved to the end of that year. wasn’t there the possibility of a season opener against Cal in the georgia dome a year or two ago…or maybe the 2010 season that never materialized? I wish we would get into more of those neutral site games that get you some serious exposure. Granted we got a ton of exposure this past season though not all of it positive, but there is something really satisfying about seeing your team win on a neutral field and even more when they go to someone elses house and hand it to them. I’d love to see a home and home with texas, ohio state, florida state, miami, etc. We did the home/home with USC just before they went into dynasty mode. I think oregon would do a home/home with us now. I know the loss of home game revenue is why the schools really don’t do it…aside from the possibility of losing and ruining your season. I say whip’em out and go big! If you could do a home/neutral/home like GT was supposed to be in early 90’s who would you like to see us play and why? I think I’d prefer FSU, Miami, or an up and comer like UCF. Would be nice to make a weekend vacation out of it on 2 of those 3. I recall the TD in the ’88 Sugar was from Slack to R. Reeves just before the half. Best thing was how Reeves dragged Deion Sanders into the endzone. Sanders wasn’t much of a factor that game, except for the final int at the end. gotta say I was one of the students doing the “Tomahawk Chop” after the 90 FSU game. Great game. I was in the band back in ’90. At one point in the second half, one of our trumpet players either knew or figured out the notes for the FSU war chant and quickly taught it to the people around him. It spread like wildfire through the band, and for pretty much all of the fourth quarter we were playing the war chant just as much as they were. I’m not sure anyone ever did that to FSU, before or since. Dr. Vinson tried to stop us, but once the student section picked it up, it was over. Bonus memory: The best beer ever was the one I chugged immediately after that game at some random person’s tailgate behind the Pharmacy building. Bobby Bowden is a lowlife who wraps himself and his gargantuan ego in religion to cover his tracks. That is all. What a thought provoking article. Thanks a million for helping me relive many of the years when I went to every Auburn game. Another note about that 2001 LSU game. Damun Duval actually had a “shrink” following him around on the field in the pregame warmups. You can see the guy walking near him in some of the old films. Weren’t they both walking through the LSU band during pregame? I also remember a 1986 game between Auburn and Kansas that was originally scheduled to be played in Tokyo, Japan. Smarter heads prevailed, and Auburn whipped them 56-0 in Auburn. That is the game that was 49-0 at halftime, and the Kansas coach spoke to the refs and the clock “ran” for much of the second half. A two hour game, if I remember correctly. Who would Auburn played in 1957, if they had been bowl eligible?. In those days, the bowl game was a reward for a great season, and the National Championship has already been awarded. At that time the Big Ten could only go to the Rose Bowl (Ohio State). I haven’t looked at the other great teams that year. Notre Dame, who had their 47 game win streak ended, didn’t go to bowls in those days. In 1958, might Auburn have been matched up in an all-Southern Sugar Bowl against undefeated LSU ? In 1963, Auburn lost to an unsung Mississippi State team 13-10. If they were undefeated, they might well have played Texas, who won the National Championship, in the Cotton Bowl that year. Again, the NC was awarded before the bowl game. Another thing to think about…from 1964-1968, Auburn won 6,5,4,6. and 7 games. If that kind of thing had happened in today’s age of talk radio, wall-to-wall blogs, etc, would Shug have survived that scrutiny? I enjoyed this, and have long thought of how the ND/AU Sugar Bowl would have played out. Though going a but further back, 1958 would have produced some great games, if the SEC had its divisional alignment- AU may have repeated with wins over LSU and Ole Miss.